Our music ministry embraces all who attend our sung services. The voice of the congregation is supported by our 40-rank pipe organ and enhanced by our Chancel Choir. Instrumentalists and Balcony Bells play regularly in select services. Our multi-generational choral and handbell groups offer a spiritual context for fellowship in their rehearsal and worship life. 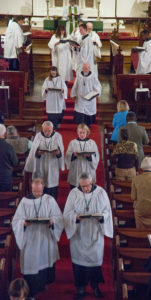 St. John’s nurtures the rich tradition of Anglican church music and shares the American legacy of folk hymns and spirituals. All members, friends, and guests are invited to share in affirming this transcendent heritage every week. News about the program, recordings from services, past repertoire lists and upcoming anthems may be found at our GoogleHome. You can also visit our Music @ St. John’s channel on YouTube! Chancel Choir welcomes musicians of all experience levels from Middle School through Retirement. The group supports our strong congregational singing at the 10:30 service, and offers weekly anthems, September through June. We sing a variety of a cappella and accompanied anthems spanning the centuries. 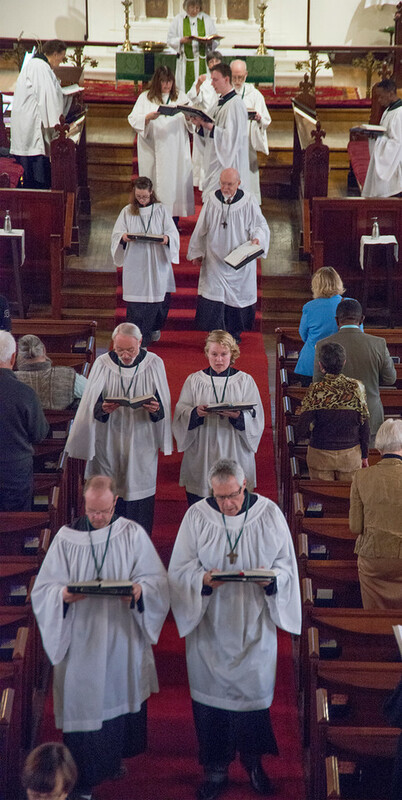 We celebrate the rich tradition of Anglican sacred music and also offer folk-hymns and spirituals. We rehearse regularly on Thursday evenings and briefly on Sunday mornings. Balcony Bells invites both novice and knowledgeable ringers to enjoy learning together on our four octaves of Malmark Handbells. The group plays seasonally and has new gloves, new stands, and new repertoire; rehearsals are Sundays, noon to 1:15 pm. Our Pipe Organ sounds forth weekly in the 10:30 service. The 3-manual Schlicker instrument was installed in 1967, and includes parts of the church’s 1892 Johnson organ and 1931 Stevens / Möeller organ. Choral Scholars assist in our services and gain professional experience in sacred music while studying at Ithaca College. The program helps enhance our liturgies, support our volunteer singers, sustain our musical heritage and encourage a new generation of church musicians. Gifts to St. John’s marked “Choral Scholars” are placed in a dedicated fund supporting this new program. Instrumentalists, both student and adult, are encouraged to bring their musical gifts to our worship services, especially during the spring and summer months. Recent services have included oboe, piano, French horn, violin, double bass, trumpet, and banjo — but not at the same time! Guest Conductor and internationally known choral composer Crawford R. Thoburn regularly assists and sings with the choir. New Hymnals were dedicated on October 1, 2017, when the Lift Every Voice and Sing Hymnal joined the Hymnal 1982 in our pews. Read more here! CONTACT Director of Music / Organist Karen Hindenlang for more information at stjohns@clarityconnect.com . Here is her 2016 Annual Report for the Music Program; and you can read about her appointment in April, 2014.